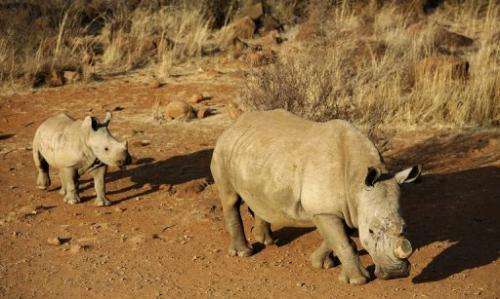 A black dehorned rhinoceros is followed by a calf on August 3, 2012 at the Bona Bona Game Reserve, 200 kms southeast of Johannesburg. More than 500 South African rhinos have been killed this year, official figures showed Wednesday, amid strong demand for horns on the Asian black market. "As of yesterday (Tuesday), a total of 515 rhino have been killed so far this year," said the environment ministry's deputy director general Fundisile Mketeni. The lucrative Asian black market for rhino horn has driven a boom in poaching in South Africa, which has the largest rhino population in the world. Many of the killings are thought to be perpetrated by poachers from global syndicates. Last year, 668 rhinos were killed in South Africa, a record high that could be surpassed if the poaching continues at today's pace. The army's deployment in the hardest-hit area, the Kruger National Park, has done little to stem the killings.